I had been working with Tony as a work-study student in 1995 to assemble the Ecole Initiative, a web collection of links that Tony had reviewed. A key feature of the Initiative was temporal searching - users could find events that occurred around a certain date as long as they were added to the database. Although Ecole was a useful resource, finding information about a specific subject nonetheless involved browsing multiple collections and URLs, and this was still tedious. Additionally, Altavista and Lycos, the popular search engines of that time, did not have any provisions to address our specific needs. The summer of 1997 was about scaling up our fledgling effort and making real Tony's vision of a peer-reviewed, quality-controlled section of the internet in the Internet Applications Laboratory ("IALAB"). This fancy name referred to an empty desk in Tony's office and a $10K budget to cover all the hardware needs for the project AND the salary for my summer internship. Today, we would create an AWS or Azure account, provision a virtual server and set up CentOS or Ubuntu. Unfortunately, none of those things were available to us. We had previously downloaded a copy of Slackware Linux and ordered a UPS, a tape drive, and two expensive dual-processor Pentium Pro towers from Gateway. Both computers were intended to be configured almost identically for redundancy, but generally meant for two different missions: one for crawling web pages and creating the search database, and the other for serving web pages and executing search queries. Although we had a 100 Mbit switched Ethernet connection to the IALAB, 10/100 Ethernet cards were new in this era of blazingly fast 56K modems, aol.com e-mail addresses and scandalous ASCII art pin-ups. The Intel 10/100 Ethernet cards on our Pentium Pro machines needed an e100 driver which did not then ship with Slackware. Also, multi-processor support was new to Linux and many drivers were not stable in multi-processor kernels. I had recompiled the kernel for our hardware using the menu-based kernel configuration utility, but adding an unsupported driver to the kernel was a little outside my depth, and simultaneously alien and barbaric as far as the University's IT department was concerned. Hiten Sonpal is a Computer Engineering graduate of the University of Evansville, and the first intern of the now-named CSML. He is currently an Engineering Director at iRobot Corporation, overseeing the Mechanical Engineering, Far East Engineering and ID/UX groups. In his spare time, Hiten enjoys rooting for the New England Patriots, and swimming and biking with his wife and two kids. This blog entry does not reflect the views of his employer. Note that the model agrees with the crowd on all games but one, the MIN @ GB game in which the model goes for MIN and the crowd for GB. This should be a good game to watch. Games to watch: MIN @ GB and really all of them this week. Below please find the 2015 week fifteen NFL results based on the model we built last year. This model uses a learning algorithm fed by data from the last fourteen weeks. To date, success rates this season are as follows: Week 2, 50%; Week 3, 62.5%; Week 4, 60%; Week 5, 64%; Week 6, 57%; Week 7, 50%; Week 8, 71%; Week 9, 53.8%; Week 10, 42.7%; Week 11, 57.1%; Week 12, 56.2%; Week 13, 62.5%; Week 14, 56.2%, and this Week, 68.7%. Note that the crowd was also correct on 68.7%, though there was divergence on two games: the model as incorrect on the CHI @ MIN game where the crowd was correct, and the model was correct on the DET @ NO game where the crowd was incorrect. Importantly, the weekly model percentages for the season are still remaining pretty flat, which is a gain over last year, even though last year's overall accuracy was higher. See Week Fourteen NFL Results for more. Due to the holiday, Week 16 Predictions and Results will not be posted. The percentage correct, however, will be posted with the Week 17 reports. Below please find the 2015 week fifteen NFL predictions based on the model we built last year. This model uses a learning algorithm fed by data from the last fourteen weeks. To date, success rates this season are as follows: Week 2, 50%; Week 3, 62.5%; Week 4, 60%; Week 5, 64%; Week 6, 57%; Week 7, 50%; Week 8, 71%; Week 9, 53.8%; Week 10, 42.7%; Week 11, 57.1%; Week 12, 56.2%; Week 13, 62.5%; Week 14, 56.2%. I am uncertain about what to think of the DEN @ PIT game. The model predicts PIT, which seems a good call, but this will be a game worth watching, no doubt. Games to watch: CHI @ MIN, BUF @ WAS, DEN @ PIT, DET @ NO. Below please find the 2015 week fourteen NFL prediction results based on the model we built last year. This model uses a learning algorithm fed by data from the last thirteen weeks. To date, success rates this season are as follows: Week 2, 50%; Week 3, 62.5%; Week 4, 60%; Week 5, 64%; Week 6, 57%; Week 7, 50%; Week 8, 71.4%; Week 9, 53.8%; Week 10, 42.7%; Week 11, 57.1%; Week 12, 56.2%; Week 13, 62.5%, and this week 56.2%. Note that the model agrees with the crowd in correct and incorrect calls except in the IND @ JAX game where the model was correct and the crowd incorrect. A closer inspection is necessary, but it looks like we are close to a heuristic that accounts for the way the crowd makes decisions. 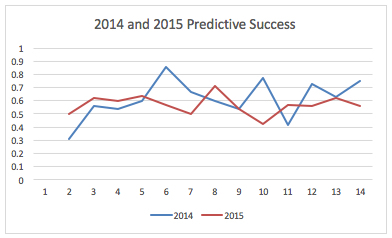 Note also that while the overall predictive success of 2014 was averaging higher than 2015, the 2015 results are less erratic than the 2014 results. We are watching this closely. If the pattern persists in this matter, we will have done something successful with a slight tweak to last year's model that will be explained in a later post. I expect that things will become a little more erratic during the last three weeks of the regular season as teams fight for a place in the playoffs. NE (.57) over HOU (.56) - Very Close Game ??? Below please find the 2015 week fourteen NFL predictions based on the model we built last year. This model uses a learning algorithm fed by data from the last thirteen weeks. To date, success rates this season are as follows: Week 2, 50%; Week 3, 62.5%; Week 4, 60%; Week 5, 64%; Week 6, 57%; Week 7, 50%; Week 8, 71%; Week 9, 53.8%; Week 10, 42.7%; Week 11, 57.1%; Week 12, 56.2%; Week 13, 62.5%. Again, I'm sorry to say that I didn't get this early enough to get the crowd agreement on the Thursday night game. Otherwise, note that the model agrees with crowd except on one game, the IND @ JAX game, where the model weighs in favor of JAX. Note also that only one game is predicted to be "very close" by the model in which NE is predicted to win over HOU but only by a little. This strikes me a very counterintuitive. NE should win this easily, but we shall see. The model and crowd both predict a win for TB over NO. Personally, I wouldn't be surprised to see NO win this one.